I confess that I am a Catholic who loves Jesus. In fact, I became a Catholic - having been raised Southern Baptist - so that I could be a part of His Church. You know, the ONLY Church where you can experience Jesus personally in the Flesh via His Real Presence in the Eucharist. When one says he is Catholic, a member of "the Church", what one is professing is that he is a member of the Mystical Body of Christ, His Bride, His Church, His sheep... One cannot separate the Catholic Church from Christ. It's impossible. Some (but certainly not all) "reformed" Christians seem to think that Catholics don't "know" Jesus - that all we care about is Church this and Mary that. Having been in my life both a Protestant and a Catholic, I can tell you that no "reformed" Christian has ever experienced Jesus as intimately as the Catholic who receives their Lord and their God - Body, Blood, Soul and Divinity - into their body at Mass. 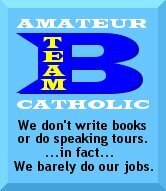 So, what does all this have to do with being an "Amateur Catholic®"? Absolutely nothing. Just a friendly reminder of what it means to be a plain-old-no-modifier-added Catholic - regardless of Amateur® or Professional® status. I love Jesus, too -- and His Church, the Catholic Church. What? You love Jesus and you are Catholic? I bet you think this makes you a Christian huh? But you see, after all, we ARE "reformed" Christians - by the power of baptism. We're Presbyterians, because we have "presbyters" which is the Greek technical word for the office we commonly call "priest". We're Evangelicals, because at EVERY Holy Mass the GOSPEL is proclaimed. (I've never grasped how some Christians can have a Sunday Service and read NOTHING from the gospels.) Oh yes, "gospel" is just an old English word meaning what "evangel" means in Greek - that is, "GOOD NEWS". Oh, yes - I love Jesus too. And love your neighbor as your self. Which means, if we are ALREADY loving God with ALL our everything, then the love of neighbor must somehow arise from our love of Him. We also have a strict method for Mass, so I guess we are Methodists, too. I am amazed at the fallen-away Catholics who claim that the Bible is not used at Mass. I wonder to myself, "What Mass did THEY go to? Did they SLEEP the whole time???" You guys are addictive over here, and all you've got for the most part are intro emails and code.